Manchester City left-back Angeliño has been one of the better players at NAC Breda this season, and has twice been named the Eredivisie Talent of the Month – most recently in December. The 21-year-old Spaniard has 2 goals and 4 assists in 29 Eredivisie appearances and has impressed along with fellow City loanees Manu García and Thierry Ambrose. 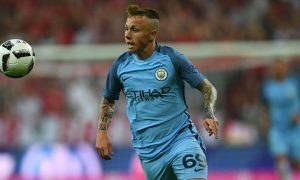 It is clear that Angeliño is ready to step up to the next level, but will that be as part of Pep Guardiola’s first-team squad or elsewhere? Angeliño has been quizzed about his future in an interview with the Dutch branch of FOX Sports and sounds like a young man determined to take his chance at the Etihad Stadium, should he be given one. “I am ready,” Angeliño declared. “I’ve already been loaned out three times and the first time was difficult. I am waiting for my chance [at City] and will be ready for it. “PSV, Ajax and Feyenoord are top teams that everyone wants to play for. But going back to Manchester City, the Premier League, is also good. Breaking through at City is an incredibly tough prospect for any youngster, but with Oleksandr Zinchenko getting plenty of game time as a converted left-back, there may be an opening for Angeliño to impress Pep Guardiola in pre-season. Many of City’s big names will be on World Cup duty this summer and subsequently given extended breaks after, meaning Guardiola will be reliant on his youngsters in pre-season and may look to integrate some of them into his star-studded squad should he have any vacancies. And Angeliño sounds like a man ready to take his chance and make the next step in a promising young career.